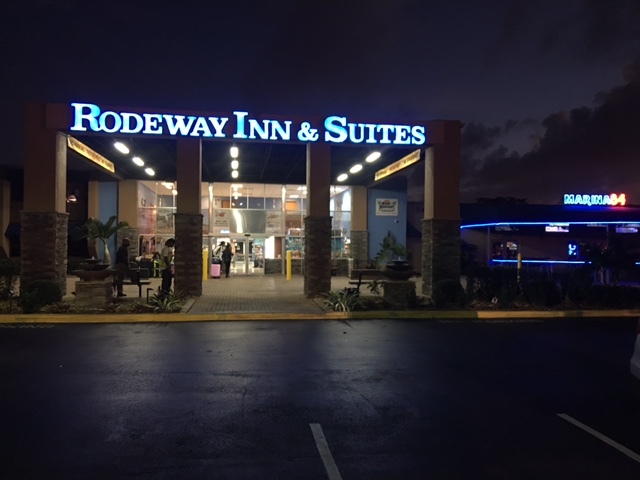 Rodeway Inn & Suites – Fort Lauderdale Airport & Cruise Port, a budget-friendly, full-service hotel near Fort Lauderdale’s Port Everglades Cruise Port and near the Fort Lauderdale/Hollywood International Airport (FLL), recently unveiled building upgrades including a renovated meeting room, landscaping and parking lots as well as unveiled a new elevator and fitness center. The new elevator, located on the East side of the hotel, will allow guests with limited mobility and guests with heavy luggage to move across the different floors of the hotel without having to utilize the stairs. The Mowrey™ elevator is rated for 3,000 pounds, and can hold approximately 10 people. The second part of the summer renovations at this Fort Lauderdale cruise hotel is the new fitness center. Located on the second floor, above the lobby and check-in area, the fitness center features Pro Maxima™ treadmills, and a Pro Maxima™ recumbent stationary bike. Guests looking to get in a short run or stationary bike ride while staying at Rodeway can also entertain themselves with wall-mounted flat-screen HD TV. The fitness center is open to all hotel guests at all times. The summer renovation project also include a complete refurbishment of the hotel’s conference and meeting room, ideal for weddings, receptions and business events. This Fort Lauderdale cruise hotel also updated landscaping, and refurbished the hotel and long-term parking lots. This entry was posted in Uncategorized and tagged Elevator, Fitness Center, Fort Lauderdale Cruise Hotel, Fort Lauderdale Hotel, Renovations. Bookmark the permalink.